Hi, it’s Bailey. 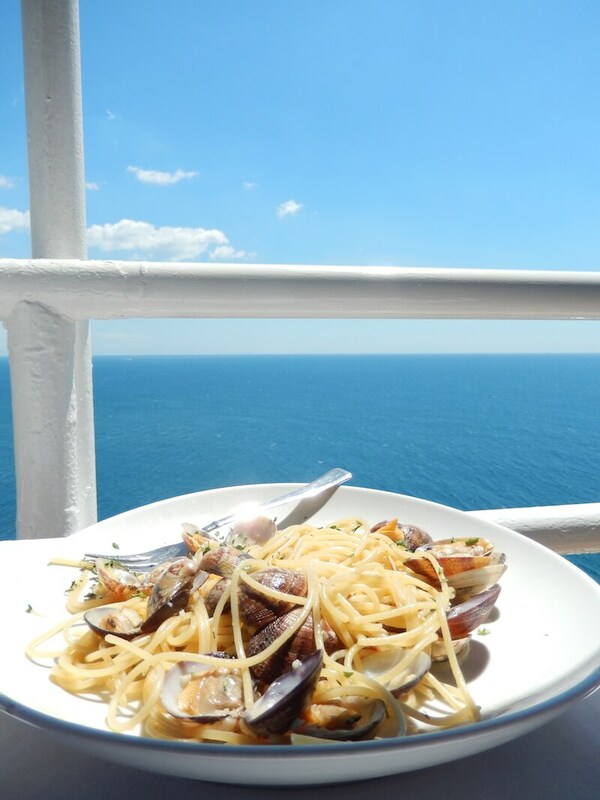 I love pasta, and now that I am in Southeast Asia, I really miss it. There are some restaurants that offer it, but it never taste like the real thing. 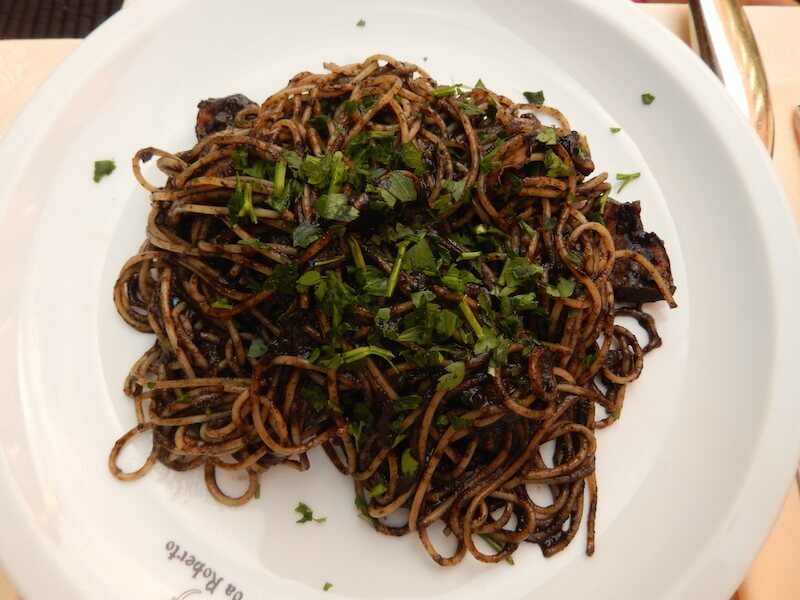 My favorite pasta in Venice was the pasta al Nero di sepia, which is squid ink pasta. I got it at Da Roberto, a really nice restaurant. My mommy and I sat on the outside area, watching the gondolas pass by, hearing the excitement of tourists near the San Marco square, and really enjoyed it. I also had vongole pasta with manila clams in a place that’s famous for it, called Osteria Mascaron. IT WAS SO GOOD. In that place, they mostly serve portions for 2 people, and they are HUGE. I think you should always share with someone, it’s more fun. The clams were some of the best parts! Make sure to eat some if you ever go. In Milan, they are famous for a dish called Cotoletta alla Milanese. (veal cotoletta, which is a crispy, thin piece of veal, pounded super hard.) It’s really delicious. I think any local place in Milan serves a decent cotoletta. 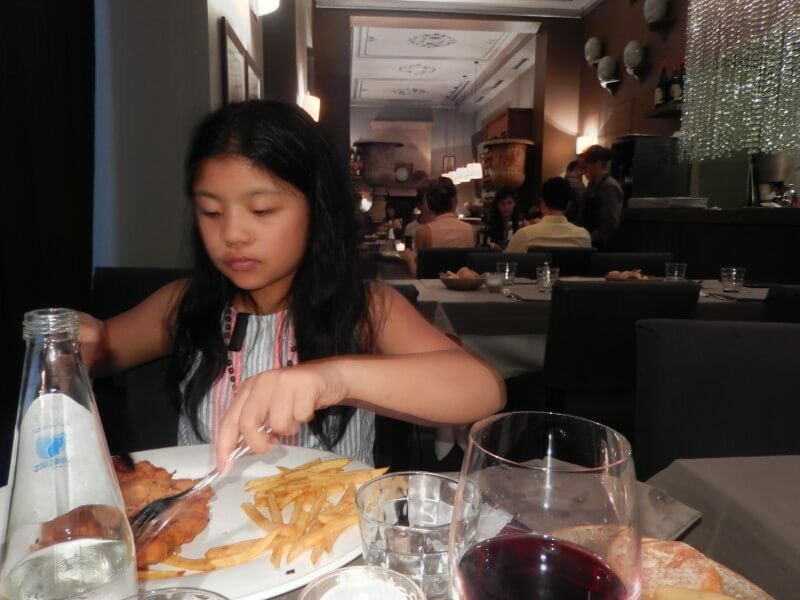 I thought the best was in Ristorante Convivium, a very nice, quiet, calm, fancy place…shhhhh… My mom and I shared one, and it was SO good!!! ;). Eating Cotoletta at Convivium in Milan. We also went to a very small town called Pomaia in Tuscany where we were joined by my aunt and cousin. We stayed in an Agriturismo called La Lespa. There were TONS of farm animals and a pool. Pomaia is so small that the town literally consisted of only our agriturismo, one other hotel with a restaurant. It was GREAT. Pizza at La Pieve di Pomaia. Always make sure to put on deet, though, because there were tons of mosquitoes there… We all ate at the one restaurant in town about 4 times!! The PIZZA was AMAZING, AND SO WAS THE COLD CUTS. While my cousin and I waited for our pizzas (we ordered one each for ourselves because they were so thinly crusted) we played at a cute little playground just a block away. My aunt and mom could see us on the swings and slides from the restaurant. They just called over to us and when it was time to eat. The place was called Le Pieve di Pomaia. Though it was literally only 500 steps away, we used our rented car to drive there. THEY ALSO HAD AN ICE CREAM BOX FULL OF CORNETTOS AND PRIZE ICE CREAMS, THEY WERE SUPER CHEAP, AND REALLY GOOD. If you happen to go, I recommend you order the wild boar pasta and Margherita pizza. Also don’t order the pepperoni, because it is not pepperoni, they’re peppers. That’s how they say it in Italy. La Taverna di San Giuseppe. , we went to a place called La Carrabacia Trattoria. We had stopped in Volterra because my cousin and I were getting too sick in the car to get to Siena in one go. The chef was happy to get my cousin and I a special order that was not on the menu board of tomato sauce pasta, and it was SO GOOD. Also, try the rabbit. My aunt got it and it was AMAZING! 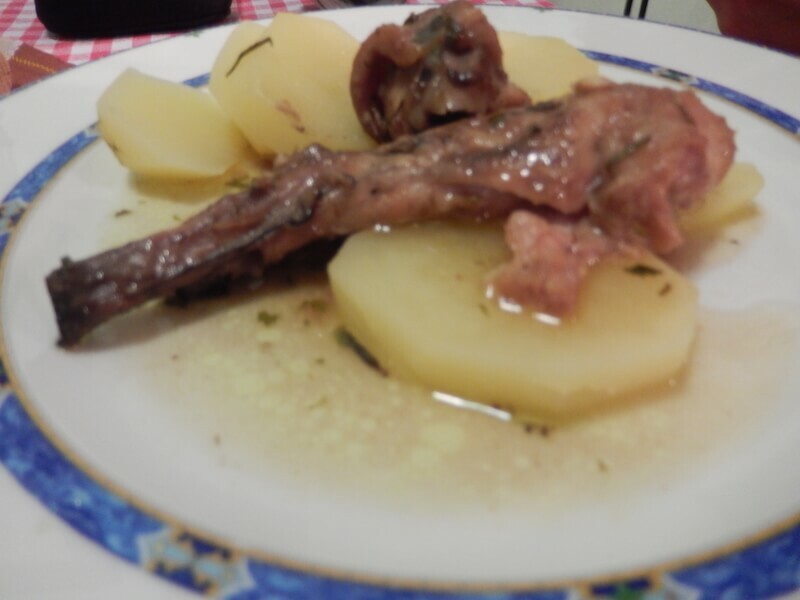 Rabbit at La Carrabaccia Trattoria. We went to a beach one day, which took us about 2 times longer than it should have because the beach was hidden down a bunch of stairs and not on the road. It was a rock beach, so no sand got in my ears. We ate at a restaurant/ hotel called Il Romito. I had a vongole pasta there, tried my mom’s bolognese shell pasta, and a bit of my cousin’s cotoletta. The view was AMAZING on the balcony, overlooking the beach. We did stay in Florence, the big, famous town for 2 days. Make sure you try out Cafe Cibreo. They are small dishes, but they are FULL of deliciousness. Pasta at Cafe Cibreo in Florence. But the BEST PASTA DISH EVER IN THE WORLD called Guinea Fowl Lasagna was in Bologna, at a place called Ristorante il Colombina, which was recommended to us by the hotel we stayed in. Another place I loved was a place called Al Pappagallo, a HUGE, FANCY place that is famous for the Tagliatelle alla bolognese, which is basically the perfect name for a dish in a place called BOLOGNA. It was al dente, and there was not too much sauce. Just the way I like it. It was AMAZING. The MOST AMAZING Pasta I’ve had at La Colombina in Bologna. I’ve been judging pasta around the world since I was 3 months old, and I am pretty good at it. So I hope you trust my taste and review. That’s all I have for food in Italy. I went to other places that were not restaurants, and had GREAT experiences, but I was just focusing on food for this post. Talk to you later! Thanks for reading! P.S. 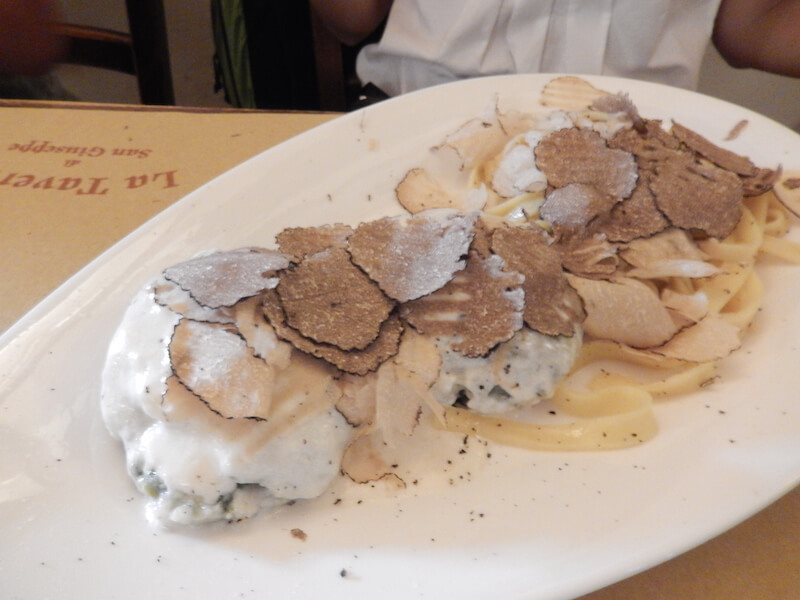 I only had one disappointing dish, which was in Venice, and it was DISGUSTING. SO, DON’T GET SOMETHING THAT SAYS, ” CREAM AND HAM”. LOOK FOR “EGG AND PROSCIUTTO OR PANCETTA.” I should’ve known… I was so hungry I didn’t even think. Loving country living at Agriturismo La Lespa – Enjoy LIFE! This post has made me *so* hungry! We are heading to Florence over Christmas so thank you for the Cafe Cibreo suggestion, I can’t wait to try out their pasta! I’m sure you’re excited to go to Florence! It’ll be a great Christmas. I think since you’re an adult, you should have the antipasti (my mom had it.) She loved it… LOTS OF VEGGIES. 🙁 Thank you for reading! 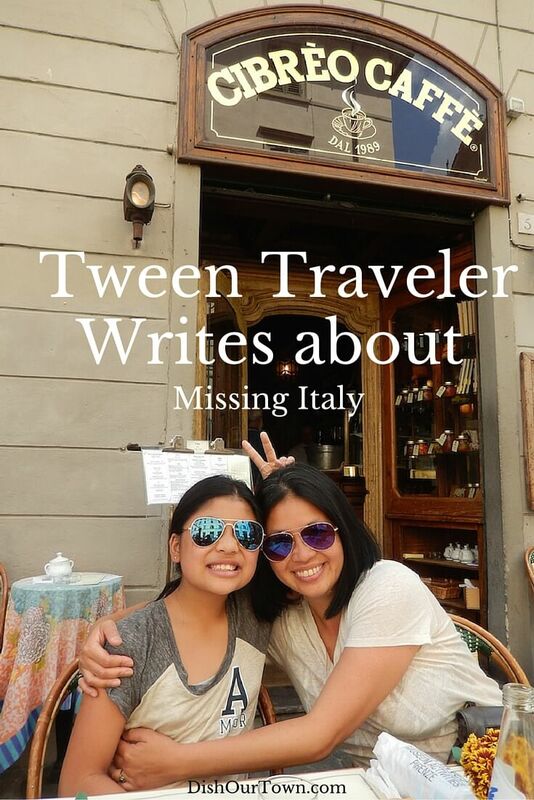 So funny – when my daughter started her own travel blog a couple of years ago, the first post she wanted to write was about food (namely, gelato) in Italy! I totally understand how/why you miss it there; I miss it all the time. You’re killing me! I want to eat ALL of this pasta! I love pasta!! Hopefully you’ll get to try some of these dishes soon! Thank you for reading. Hi Bailey! So glad you enjoyed Italy, we just returned(we were there in September for the month) and took our 10yr old twin boys. Isn’t the food fantastic! My boys are adventurous with their eating just like you and ate everything from frogs leg and snails(we visited Paris before Italy) to anchovies, mussels and wild boar pasta! Enjoy your wonderful experience! P.S are you coming to Australia?